This Grape Salad has a cheesecake like coating, crunchy topping, sweet grapes and a crispy crunch that makes for the perfect dessert for any occasion. With summertime just around the corner, there will be lots of cookouts, family gatherings, and picnics. I know when I need a dessert to carry to a cookout, this Grape Salad is always a hit! Who wants to heat up their kitchen when its hot outside? Not me! This salad will keep your kitchen nice and cool and your taste buds dancing. This salad will have you wanting more, more, and more! You will want to eat this whole bowl by yourself. I had to literally stop myself from eating this!! It has a cheesecake like coating that goes perfectly with the sweet, juicy grapes. It is creamy, crunchy, cool, and sweet all in one bite! The topping is pure bliss. Brown sugar and toasted pecans garnish the top of this delicious dessert. It is quite heavenly! I made this dessert for a special occasion we had at church. Every bite was gone..eaten..no leftovers! Everyone raved at how delicious this Grape Salad tasted. This only takes minutes to throw together. The ingredients are super simple and when everything is mixed together…..it is absolutely yummy! This makes the perfect dessert for any occasion–even movie night at home! 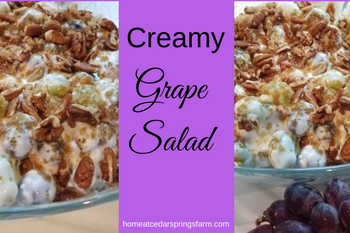 I hope you enjoy this Creamy Grape Salad as much as I do! 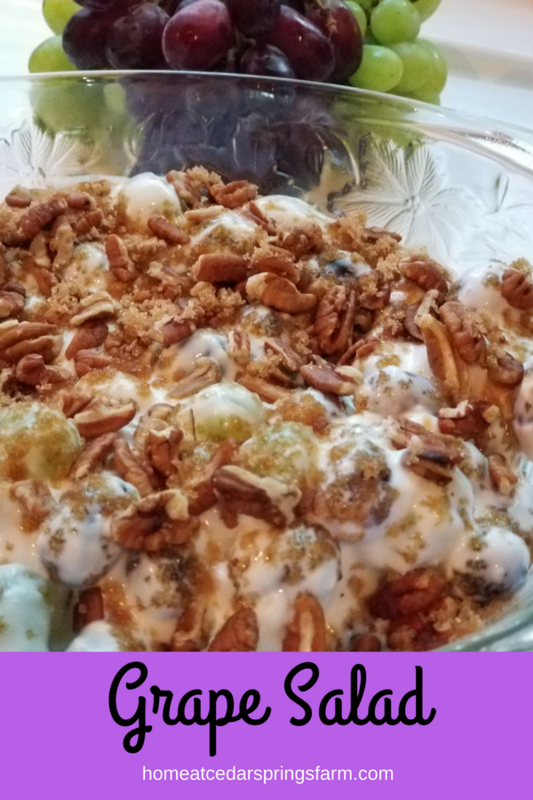 This Grape Salad has a cheesecake like coating, crunchy topping, sweet grapes and a crispy crunch that makes for a perfect dessert for any occasion. Mix together sour cream, cream cheese, and sugar. Use a mixer to blend until smooth. Add grapes to the creamy mixture and gently mix everything together until all is coated. Toss together pecans and brown sugar. Then add to the top of the grape mixture. Refrigerate for 4 hours or overnight. You can serve immediately, but it is better if you can make ahead and chill before serving. Yum, you had me at cream cheese. This reminds me of my favorite salad (lettuce, feta cheese, grapes, pecans, apples), but in a dessert form. Can’t wait to try! I’ve never made a grape salad, but this sounds delicious! And I agree with Melissa… anything with cream cheese is good in my book! I could eat a bowl of just the pecans alone!